Daydreams of Quilts: Edge Tote - Pattern by "The Iron & Needle"
Edge Tote - Pattern by "The Iron & Needle"
For today's WIP Wednesday project I am working on some bags using a pattern designed by Brianna of The Iron & Needle. The pattern is called "Edge Tote Pattern" and you can find it in her Etsy Shop. Brianna is from Ontario, Canada. In addition to quilting and sewing she enjoys kayaking, reading and photography. I sewed this Edge Tote last night from start to finish so it can be done in one evening. I think it took me about two hours to make it. This one is going out in the mail tomorrow to my August Secret Pal in the year-round "Secret Pals" swap on Instagram. There are a few other special people in my life who I think should have one of these fabulous bags as well. Today I am working on one with toile. Such a timeless classic fabric. The red is quilting cotton weight and the yellow is home decor weight. I like to make bags with home decor weight so I don't have to interface it. The pattern does give instructions for interfacing your quilting cottons so you can sew it with whatever fabrics you like. I love the diagonal cut on the pocket. I used some twill tape for trim on the outer pocket and a little piece of zakka tap in the side seam with sewing tools on it. I used home decor weight fabrics for the outside of the bag and pocket. The ticking stripes are off cuts from some IKEA curtains I had in my old house. The fabulous pocket fabric was a gift from one of the ladies in my #CanunckBdayClub. The twill was also a swap gift. The lining is quilting weight cotton. I lined the pocket and the bag interior with the same fabric but I might change it up on the next bag and use two different fabric choices. I also recently bought some gorgeous Kona fabrics from one of my favorite online Canadian fabric shops Mad About Patchwork and I am using these to make a baby quilt using Brianna's amazing Tilted Quilt Pattern. This pattern has 10 variations and you can learn more about it in this blog post. Brianna made a fantastic "Lone Wolf" quilt which is one of the pattern variations and there are photos of it in her pattern introduction post. 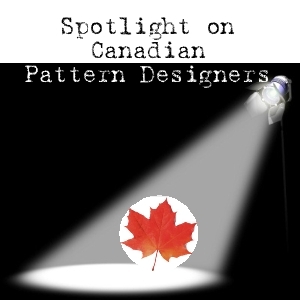 I hope you have enjoyed learning about a Canadian pattern designer who has brought some great ideas to life. Thank you for stopping by to see my WIPs this week. I am linking up with the linkys "Let's Bee Social" and "WIP Wednesday". Buttons for those are in the button bar so you can visit and see what everyone else it working on.